Are you hoping to manifest a new or stronger love in your life? New moon spells may hold the answer you’ve been looking for. If your goal is to create something new in your romantic life, you may be tempted to sign up for online dating, refresh your wardrobe and other tasks designed to get you out of your dating rut. All of those are good things to do if you feel inspired, but here is something you should try first: New moon spells for love can give your new romantic manifestations some wings. The energy of the moon is powerful. Think about it — water is the most powerful element in the Universe, yet the moon has dominion over its rise and fall. Taking that notion a step further, consider the fact that more than half of our bodies are made up of water. So don’t you want the powerful forces of the moon working for you? That’s where a new moon spell for love comes in. The new moon represents the beginning of a birth cycle. Think about everything you know about birth. When a child is conceived, it takes approximately nine months before the baby emerges. When seeds are planted, there is a period of stillness before the plant springs up from the ground. The new moon is that time in which new ideas are planted and are allowed to gestate before they blossom. During the new moon, the moon is not visible to the human eye. When a manifestation begins, it is not visible to the human eye. So how can this information help you with your love life? When you want to begin a new chapter in your life, conduct a new moon ritual before taking efforts to move forward. That allows you to express your intention to the Universe, and it allows you to ask the Universe to help in the endeavor. Miracles are a result of co-creation — personal effort and assistance from the spiritual realm. Do your prep work. In order to begin your ritual, first you need to check a lunar calendar to discover when the next new moon is coming. In the days or weeks leading up to the new moon, take the time to think about the type of relationship you would like to attract. Think about the qualities that you desire in a partner and write them down. If you already have a partner and want to enhance the relationship, write down how you want the relationship to grow. Get your supplies. 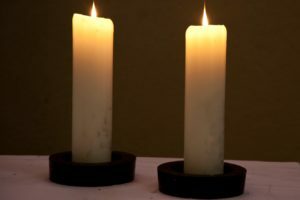 For a basic new moon manifestation candle magic ritual, purchase a pink or red candle to symbolize the love relationship you are trying to create or enhance. Often a pink candle is used for a new love while a red candle is used for an older, more intense or passionate love. Set aside ritual time. Timing is everything for new moon spells. On the night of the new moon or one or two nights after the new moon, enter a sacred space where you won’t be disturbed; then clear your mind and take a few deep breaths. Write down your intentions for your love life and what type of partner you’d like to attract. If you already are in a relationship and you’d like to enter a new chapter in that relationship, write about how you ideally want the relationship to be. Burn the candle. Put your notes aside and release the outcome. As the candle burns, your intentions will be released into the Universe. Look for signs and synchronicity. Once you’ve done that, follow any inspirations that come to you, whether it’s going on a blind date or joining an online dating site. Now that your new moon ritual for love has been performed, let your intuition guide your way.